Tokyo’s permanent Pokémon Cafe has updated its menu in recognition of the release of Let’s Go, Pikachu! and Let’s Go, Eevee!, the first games in the Pokémon franchise to land on Nintendo’s Switch console. But while gamers have a tough decision to make regarding which of the paired games they’re going to buy, the Pokémon Café says “Why not have both?” by offering the Pikachu and Eevee Muffin Plate Friends set. 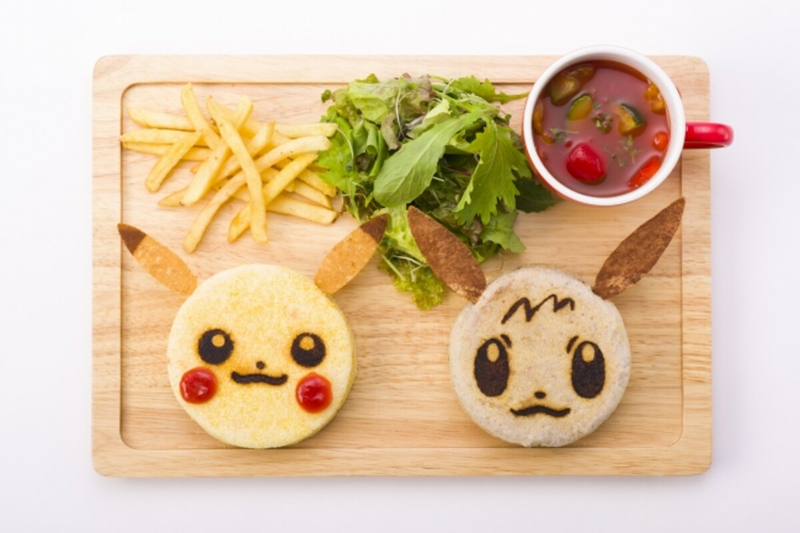 ¥1,706 (about US$15) gets you muffin sandwich likenesses of both Pikachu and Eevee, with the former stuffed with bacon and eggs and the latter with an avocado, tuna and mayo mixture. They’re accompanied by a cup of the café’s tasty vegetable soup (which also accompanied the Eevee burger SoraNews24 ate on their first visit to the café), a green salad and French fries. On the other hand, if you’re all about Pikachu—and only Pikachu—there’s the Pikachu Plate Set, which costs ¥2,894 or ¥4,082 (about US$26 or US$36, respectively), depending if you want to take the actual plate itself home with you. It comes with a hamburger steak, rice omelet, salad, lemonade float and, best of all, a slice of mango cheesecake shaped like Pikachu’s zigzagging tail! Meanwhile, dedicated Eevee supporters can opt for the identically priced Eevee Plate Set, which features a chocolate float and caramel cheesecake, once again shaped like the respective Pocket Monster’s tail. Both the Pikachu and Eevee sets can also be ordered without drink or dessert for ¥1,706 (or ¥2,894 if you opt for the souvenir plate). But what might be the coolest thing of all about the updated menu are the Pokémon Lattes, which cost ¥756 each. “Okay,” you might be thinking, “those are cute and all, but latte art is pretty common at themed restaurants in Japan, right?” Yes, it is, but those five designs above? They’re just a small sample, because in honor of Let’s Go, Pikachu! and Let’s Go, Eevee! going back to the series’ original Kanto Region setting, the Pokémon Café is offering 151 different latte art designs, one for each of the original 151 Pokémon species. What’s more, the design you get isn’t random like at most themed cafés. You actually get to pick which Pocket Monster you want gracing your cup, which the staff will then prepare to order. The new menu will be available until January 11, 2019. While that may not be quite enough time for fans to drink ‘em all, it should let you at least enjoy the latte art for a couple of your favorites! Read the original article from SoraNews24 via the link below.